To achieve collective impact, individuals and organizations should align to community goals. The “collective” in collective impact is critically important. No doubt. All of us — across sectors and every corner of the community — need to work together to achieve population-level results. But we are finding something interesting to be true: Each individual and organization is equally important to achieving the impact we all desire. Individual and organizational action is in many ways the key to collective impact. We find that people often come to tables convened in the name of collective impact with the wrong mental model. They may think they are coming to an advisory board where they can weigh in and provide some guidance. Or a nonprofit board where they provide guidance to an executive director. Or maybe even a task force where they will make recommendations and help implement some solutions. None of these will work for us to move the dial at scale. This work can’t be deputized to an individual. And it can’t even depend on us working in perfect concert around a powerful set of actions. Sustainable impact depends on the willingness of each and every individual and each and every organization to think differently about what they do every day. And most importantly, each must be open to changing what they do to make sure they are aligned with agreed upon outcomes, using data on what works for kids to guide their actions. This is a completely different mental model. It means partners are coming to the table to weigh the collective interests of the community equally with their individual and organizational interests when making decisions. That is partnership. That means an investor will align with the collective outcomes and make decisions that align with peers focused on a similar outcome. A practitioner working with children will share programmatic data with the confidence peers will do the same so everyone can improve together. An elected official will remove barriers to aligning precious public resources behind what works. A faith leader will mobilize her congregation to advance practices that get results for kids. And an educational leader will share accountability for results while working with partners to build on what works and improve what does not . Coming to the table to achieve collective impact means doing the hard work collectively, but even harder work individually and organizationally. Isn’t it ironic? 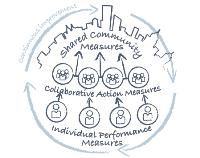 Read more about individual, collaborative and shared community measures in our new data sharing playbook, StriveTogether Data Drives School-community Collaboration.